Welcome to Sinfonia Chorale's 2015-2016 season. Since the last newsletter, the choir has enjoyed a visit from our friends in the Bergedorfer Kammerchor and their Musical Director, Frank Löhr. A most interesting programme had been arranged for their four day visit, including a lunchtime concert in The Chapter House of Lincoln Cathedral and another at Southwell Minster. On the Saturday evening, the two choirs joined forces and performed together in St. Barnabas Cathedral. We were delighted by the number of people in the audiences at all the venues, particularly on Friday lunchtime at Southwell Minster which was attended by over 200, and on Saturday evening we had over 100 in the audience. We know that many of you attended and hope you enjoyed hearing the very accomplished German Choir. Naturally, these occasions do not just happen by chance. Many Sinfonia members were involved in one way or another, but the bulk of the work fell upon the shoulders of our indefatigable chairman, Pam Richings and her stalwart team of helpers on the tour committee, Christine Kirby, Liz Pike, Jonathan Page, Lesley Cohen and Teresa Marchewicz. Everyone involved thoroughly enjoyed the experience and it was good to renew friendships we had made on our visit to Bergedorf last year, to meet new people and to make music together. Once again we have an exciting programme planned for the coming months. 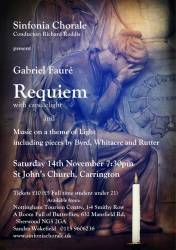 The first concert of the season is on Saturday November 14th at 7.30 pm at St. John's Church, Carrington, NG5 2DL. 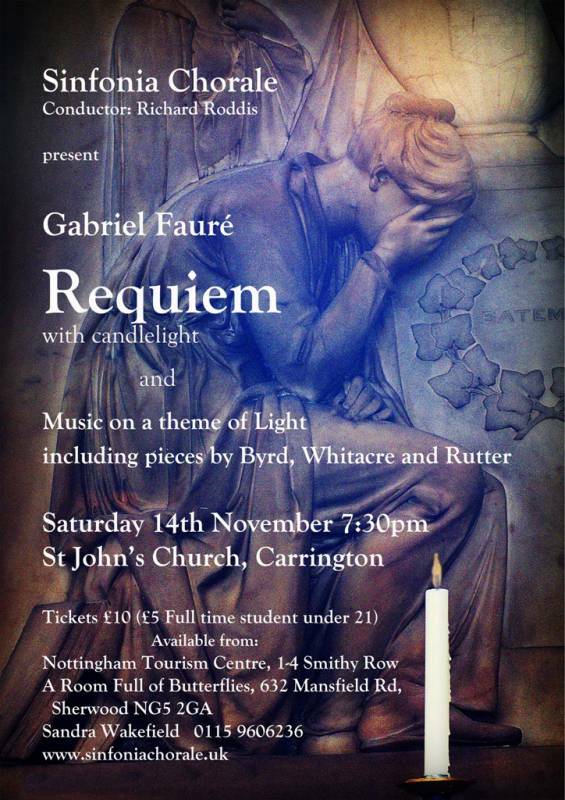 To celebrate the International Year of Light we shall give a candlelit performance of the Fauré Requiem along with pieces by Byrd, Gabrieli, Whitacre and Rutter. The performance will be directed by Richard Roddis and the Organist will be Tom Corfield. We shall be celebrating the Christmas Season with two events. Once again we have been invited to sing at Patchings Farm Arts Centre, Calverton, NG14 6NU on Sunday December 13th at 7.30 pm. On Tuesday December 15th at 7.30 pm, we shall perform at Beeston Parish Church, NG9 1GA. As usual, the programme will be a mixture of both familiar and newer Christmas items with audience participation! Tickets for all these events, except Patchings Farm Arts Centre, are available from Sandra Wakefield, Tel: 0115 9606236, the Sinfonia Chorale website, or on the door - subject to availability. We start the New year with our annual "Come and Sing". This is on Saturday January 23rd, 2016 at Christ Church Chilwell, NG9 4AS. Directed by Richard Roddis, we shall be studying part of the Choralpassion by Hugo Distler and selected motets by Heinrich Schütz. The choral workshop begins at 10.00 am and finishes at 5.00 pm. The event costs £20 (or £25 if you want lunch). The information and booking forms can be downloaded from the website or are available from Pam Richings, Tel: 0115 9810874. This music will form the basis of our first concert of 2016 when we shall give a semi-staged performance of the Distler work along with the Schütz motets. We shall be performing part of this programme again at Southwell Minster, contributing to the Holy Week Devotions. This will be on Monday March 21st at 7.30 pm. There will be a retiring collection. As you can see, the programme for the year ahead is an exciting one with some well known favourites and some exciting innovative pieces. We look forward to welcoming you to our concerts and thank you for your continued support.